A Pastor was sighing, no one is preaching and even books are rarely written on that! 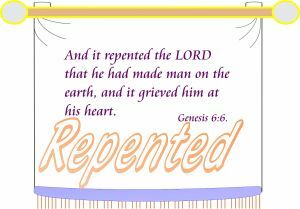 REPENT !! Read . . . . .‘when ye pray’….. mentioned in the Holy Bible (KJV) . I am no preacher, but, am a prime sinner and living in this world in HIS mercy. For a sinner like me too, when I read “The Holy Bible” KJV, the following verses were given in the context of “repented”. which he thought to do unto his people.